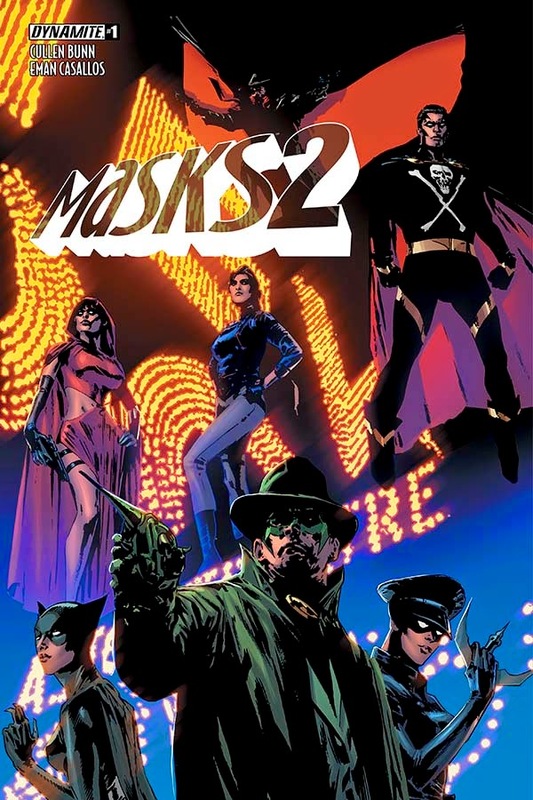 The Fellowship was fortunate enough to obtain a copy of MASKS 2 #1 from Dynamite Entertainment. The story is written by Cullen Bunn, with art by Eman Casallos, colors by Adriano Augusto and letters by Rob Steen. Green Hornet, Kato and The Shadow are in the process of stopping a shipment of crates being delivered by a group of skeleton-masked men. It doesn’t go to well as the Shadow is more concerned by punishing than trying to find out who’s behind the mysterious plot. Even with the timely assistance of Black Terror, no information was discovered. Then as on cue, Green Lama, The Spider and Lady Satan appear with a possible clue to where the enemy maybe…at a Masquerade Ball! The Mysterymen of yesterday return! Cullen Bunn crafts a quick-paced story, but catches the vibe of the time these characters were born. He captures the voices of our heroes perfectly (yeah, The Shadow doesn’t play well with others). This is probably Eman Casallos best work; it’s simply beautiful. Adriano Augusto is no slouch either; I love the colors in this issue. I’m happy to see Dynamite bring these heroes back together. If this issue is any indication, it’ll be an enjoyable ride. MASKS 2 #1 is in stores now, or available for ordering at www.dynamite.com.